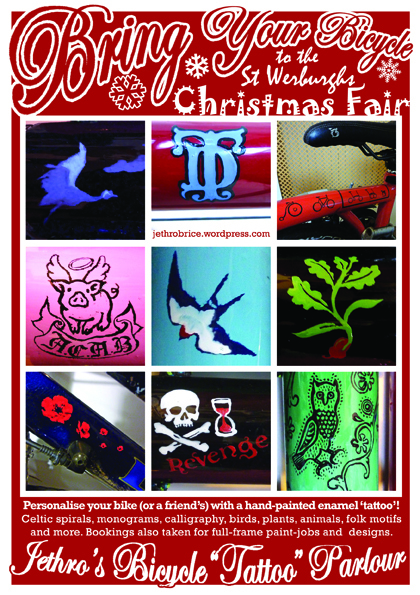 …with apologies for the religious and commercial overtones, but excitement at what looks to be an enjoyable opportunity, I’d like to welcome those of you who reside in Bristol with a bicycle to come along to the St Werburghs and Thunderbolt (Totterdown) christmas fairs, where I will be running a stall offering custom-designed, hand-painted enamel ‘tattoos’ for your bicycle or a friend’s. Prices start from £3.50 for a tiddler or £6 for a basic single motif, with discounts granted for originality or radical politics! I will also be taking bookings for full-frame paintjobs or extensive ‘tattoo’ designs.